Diamonds have a value that is universally recognized. They have adorned the crowns of kings and the fingers of brides. They are among the most costly of gems, which is why they are among the most highly valued. If you are in the market for a diamond, you know you can pay a lot. But the true cost of that diamond could be about more than money. For decades, diamonds have been stolen and/or smuggled across borders and sold to finance the activities of rebels or warlords, especially in Africa. Profits from the sale of these diamonds funded genocide, atrocities and terrorism, including most likely some activities of Al Qaeda. Understandably, diamond buyers did not want to feel they were contributing to these illegal activities. The international community wanted to stop this source of funding for wars against legitimately recognized governments. And countries that produced “clean” diamonds did not want their stones – and their sales – tainted by concerns about conflict diamonds. Both the United Nations and the diamond world itself have taken action to stop traffic in conflict diamonds. In 2000, the diamond industry, with the backing of the UN, began to develop safeguards to protect against trafficking in conflict diamonds. Countries that participate in the Kimberley Process Certification Scheme, including the United States, require full documentation of diamonds entering the country, to ensure that they have been legally mined and sold. Although it is not fool-proof, the effort appears to be working. It is estimated that at one time about 4 percent of all diamonds sold – and some estimates went as high as 20 percent – were conflict diamonds. But since the adoption of the Kimberley process, experts think that only about 1 percent of diamonds currently being sold are conflict diamonds. So how can you avoid buying a conflict diamond? If you deal with a reputable jeweler, the jeweler should be able to certify that the stone or stones you are buying are not conflict diamonds. If the jeweler cannot provide that certification, you might want to look elsewhere. You also can buy antique diamonds, which pre-date the conflicts in Africa. Diamonds are virtually indestructible, so you can buy an old diamond and have it re-set in a contemporary setting. Or you can buy Canadian diamonds. 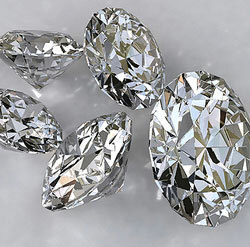 The Canadian diamond industry has very strict standards for diamonds produced in that country. Some online retailers, such as Brilliant Earth, specialize in conflict-free diamonds from Canada. By choosing one of these options, you can ensure that the symbols of your happiness are not causing misery to people halfway around the world.